Christmas lights have been a staple of holiday decorating since the late 1800’s. Before the invention of Christmas lights, many people would use candles to decorate for the holiday season. This, of course, was very dangerous. In 1882, Edward H. Johnson created the very first string of electric Christmas tree lights by hand-wiring 80 red, white and blue light bulbs and placing them around his Christmas tree, according to The Library of Congress. Not only was the tree illuminated, it also revolved. Although these lights were created in 1882, it wasn’t until 1895, when President Cleveland requested hundreds of multi-colored electric light bulbs for the White House family Christmas tree that the idea of Christmas lights on a tree took off. When President Calvin Coolidge started celebrating Christmas with the National Christmas Tree lighting in 1923, it became a very American tradition. A very common light, incandescent lights are named so due to the glow that they give off when lit. Initially, the first incandescent Christmas light bulbs were cone-shaped, called the C style bulbs, which most often referred to as "Retro" nowadays. Today, the most common incandescent Christmas light in use today is called the mini light bulb, officially named the T1¾ bulb. 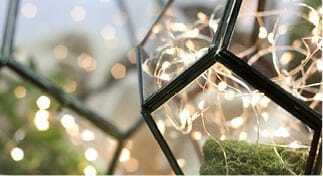 Multidimensional, these lights come in many variations and are used on most types of lit decorations. Other than the standard tube and cone lights, there are multiple variations of incandescent Christmas lights. One example is Globe lights, which come in a faceted crystal appearance, scattering the light that shines through. Their numbering refers to their diameter in millimeters, so the G12 berry lights (12 millimeters) are just under half an inch in diameter, while G30 bulbs are just over an inch in diameter, while the G50 bulbs are about two inches in diameter. At the extreme end in terms of size and specific usage are the rice and micro rice light bulbs. 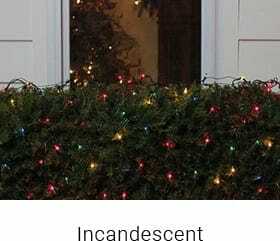 These very narrow, short bulbs have a brightness about a tenth that of even mini lights, and are mostly used in miniature decorations and small wreaths and trees. Until recently, the majority of Christmas lights were incandescent. However, manufacturers of everyday lights and Christmas lights alike have been replacing incandescent bulbs with newer technology. This has led to the rise of LED light bulbs. LED stands for Light Emitting Diode The bulb is the same shape and size as a standard mini bulb, but the surface is heavily faceted, giving it a crystal-like appearance. Another notable LED light is the wide-angle bulb. This bulb is the same width as a standard T mini bulb, but instead of a tube, it is shaped as a single flat cylinder, short and convex. Compared to other LED bulbs, the wide-angle lights stand out in brightness, due to light projecting straight out of the bulb. There are many differences between LEDs and incandescent bulbs. LEDs are cool to the touch, not being illuminated by heat. They are more durable, being made of molded plastic rather than glass. Additionally, LED light sets use less power, and emit a brighter and more distinct color than incandescent bulbs. LEDs also last far longer, with their average lifespan being around 25,000-100,000 hours of illumination. With all of these advantages, it might seem that people would immediately switch to these new style bulbs, but there are a few factors to consider. LED lights generally cost more. The difference can be as little as a few dollars on a string of miniature lights, but this may be a deciding factor. In general, LED lights are brighter than incandescent lights. The intensity of the lights can be overwhelming for people who are not used to them. Also, the colors can take some getting used to. In particular, white-colored lights actually come in three different colors. People who are looking for a light that has the same hue and tone as old style bulbs would be best suited to the Warm White or Warm Clear style bulbs, as they are shaded with a slight hint of yellow to create the impression of candle light. The lights also come in a blue-toned Polar or Cool White color, to give an icy feel. Pure white lights, on the other hand, are as close to colorless as may be expected, and have a remarkably intense effect. In most cases, LED mini lights are not replaceable. Due to their exceptionally long life, this is not an issue. They are completely sealed and watertight for superior durability. How many light sets can be plugged together end-to-end? You can connect multiple light sets together, however the total combined wattage for the light sets should not exceed 210 watts. Keep in mind that different lights use a different amount of watts. Make sure to check the package or our website for the wattage of your lights. 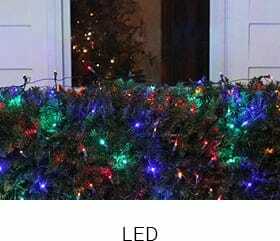 Are LED light sets for indoor and outdoor use? LED light sets are capable of being used for indoor and outdoor use, however with the brightness of LED lights, some people prefer to use them for outdoor use only. Why isn't there a transformer with my LED light set? Our LED light strings have a patented rectifier built in. This eliminates unwanted flickering and ensures delivery of the truest color possible. Icicle lights consist of a series of light strings connected to a center cord. Usually only a few inches apart, the strings - or drops - hang down anywhere from 5 - 30 inches each. The drops are usually of staggered length to prevent the lights as a whole from looking too uniform. When hung along an edge, the lights drape down over the side like a series of lit icicles, hence their name. While icicle lights are a ready-made alternative to simply outlining the contours of your house with regular string lights, there are some features that should be noted. Icicle lights are, by their nature, relatively short strings. The lights hang vertically but are placed horizontally, so a large number of lights take up a short distance. The average house will need several strings to be completely encircled. Since they hang free, they can be affected more severely by wind than average lights. A wide majority of icicle lights are mini bulbs, incandescent or LED, varying only in drop length and coloration. 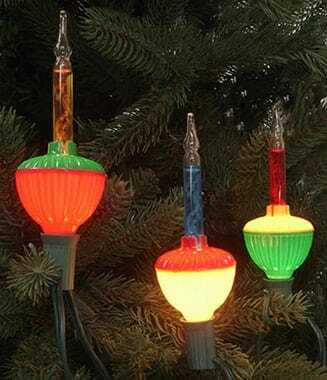 Bubble lights were once one of the most popular styles of Christmas light available and still part of many decorations and traditions today. Bubble lights are made of a liquid-filled vial heated by an incandescent light bulb. Once heated, the liquid boils and bubbles up, making the bubble light illuminate. These festive, classy Christmas lights can add a vintage look to any home. Another retro style of lights are the C-series lights. Originally released as C6 bulbs, we also have C5, C7 and C9 available. One of the most common C lights is the C7 light. Just shy of an inch in diameter, the C7 lights have a clear tapered cone shape, a screw-in base referred to as “candelabra”, and an average brightness of 5 watts. These larger bulbs are good for an old-fashioned appearance, indoors or out. The other most common C light is the C9. These bulbs are more than an inch and a quarter in diameter. They have an intermediate-sized base, larger than the C7s, and have a brightness of 7 watts. 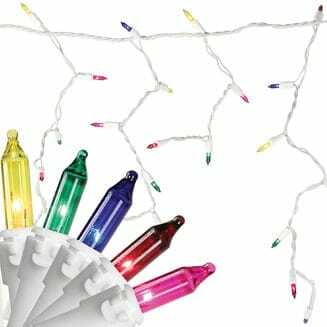 Due to their size, brightness, and the amount of heat they give off, these lights are predominantly used for heavy-duty outdoor strings and yard decorations. No matter what type of retro lights you’re looking for, you can find it here at Christmas Central. We carry a large selection of retro lights in all your favorite colors, styles, and finishes. Micro lights are smaller versions of the mini lights. These bulbs are low voltage and use less electricity than mini lights, lasting up to 12,000 hours. How many sets can be plugged in together end-to-end? None. They do not have end-to-end connectors. Instead, these lights have low voltage adapters and multi-function controllers. Are micro lights for indoor and outdoor use? Micro lights are designed for indoor use only. What is the difference between a mini and a micro light? Micro lights are smaller in size and do not have end-to-end connectors. They are designed for indoor use with thinner wires that are easier to hide. Mini lights are able to connect end-to-end and can be used for indoor and outdoor use. Rope lights are a special type of light used to make shaped decorations. Basically, they are a set of lights - usually mini or LED - wrapped in a flexible plastic sheath. The tube is rigid enough to hold its shape when bent somewhat, and can be used to create figures and shapes, even letters or words. Rope lights are often used to outline objects, or to imitate neon lighting. Additionally, we also have a number of tape light options available. With lights on the front and tape on the back, tape lights are a great choice to outline windows, cabinets and more. Mesh lights are made to cover wide areas, and are good for evenly distributing lights on unusual shapes as well. Arranged in a grid-like pattern, the rows of lights are attached by a web of wires going horizontally and vertically. While this leaves a relatively small size (most nets are around two feet by eight feet, or four by six), they consist of a large number of lights. A couple of mesh lights that we have available are net lights and trunk lights. 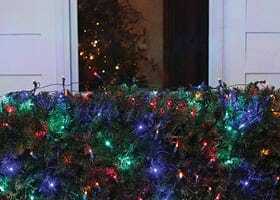 Net lights are most commonly used to cover bushes and shrubs. As they are a flexible set, they can be draped or wrapped around an object. 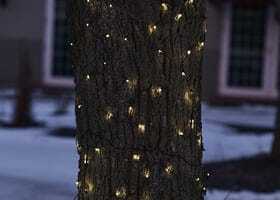 Trunk lights are designed to wrap around a tree trunk in your yard. 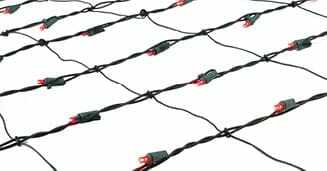 Wrapping strings of conventional mini lights in the same situation can lead to an untidy, uneven appearance, but net lights are very uniform so they will give equal, clear coverage. 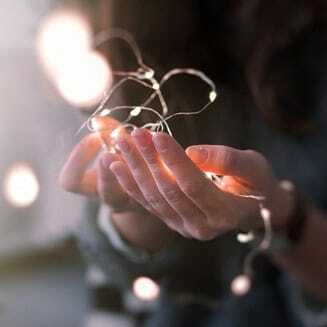 Some lights don’t come from hanging strings, but from a different setup entirely. Among these are Christmas light projectors. Most projectors have several cutouts that are inserted into the device to determine the shape the spotlights will project. It is then set up in the yard facing the house, and shines its lights directly on the front of the house. 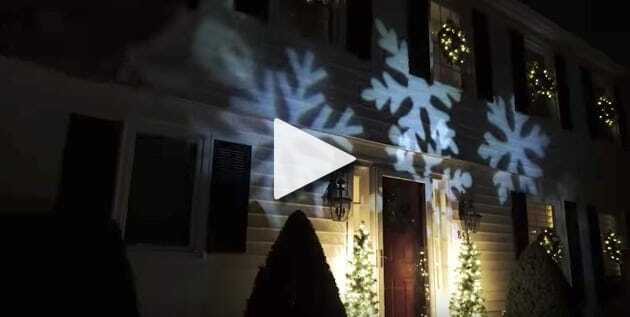 A quick bit of advice: Keep the facade of your house relatively dark to enjoy the full effect of light projectors! Christmas candles are a beautiful part of any decoration. However, they are also a fire hazard. Candles must be watched at all times, must never be left lit or forgotten about, and must be carefully placed in respect to other possessions and decorations. If this is too much of a concern, an alternative exists in flameless candle lamps. Flameless candle lamps are designed to be as similar to regular candles as possible. Most of them are even made of wax like a real candle. The only difference is in the illumination. Most use a single bulb as their light source, which either is in a flame shaped bulb at the top of the candle or embedded in the middle. Though the candle glows and flickers as if it were a flame, they are cool to the touch. In short, candle lamps offer the ability to have the look of a traditional candle without the risks, so be sure to browse through our selection. Luminaries, also known as luminaria, are a specialized type of holiday decoration. Originating in New Mexico, these paper bags weighted with sand and containing a lit candle were originally known as farolitos meaning “little lantern” in Spanish. However, their origins may date back further to Hanukkah candles and some believe luminaries lit the way for Mary and Joseph in Bethlehem. Today, they are often used to line paths or walkways much like garden stakes, or are arranged in elaborate patterns as ground level lighting designs. We offer several versions of luminaries, both traditional and modernized. Most of our luminaries include a plastic designed bag as well as a special base for weighting, usually by filling with water. Although some of our luminaries have candles like the original, flameless LED candles or strings of lights can be used in their place. With no plug necessary, battery lights can be placed anywhere, without concerns of wiring or supplying power. They are often used for special indoor decorating projects such as outlining devices or lining railings. A less common, but fun use is as part of a costume. If a person has a need for lights as part of a hat or costume, a battery string with the pack tucked safely away in a pocket is a very effective method. There are also wreaths and garlands that come with battery lights for ease of use. The average battery light string contains 10-20 lights, available with incandescent or LED lights. The size of the battery needed varies from watch batteries up through AA and C batteries. The average lighted lifespan of the batteries is 72 hours, though the bulbs last a great deal longer with replacement batteries. Please note, battery operated lights are recommended for indoor use only, as the battery pack is usually not sealed against the elements and persistent cold temperatures can lower their lifespan. A very familiar concept in the modern world, night lights assist both with allowing minimal lighting during the night and to help children sleep with added peace of mind. Our night lights come in a few different styles and options. Naturally, we have a wide array of Christmas-themed night lights including Santa, Rudolph, and more. We also have a supply of bubble night lights. Bubble lights are both calming and visually pleasing.